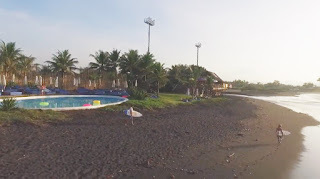 The beautiful atmosphere of the beach with beautiful natural scenery and a stretch of green rice fields and rows of coconut trees lined up along the road to Keramas Beach deserve to be chosen as your vacation spot with family and relatives when visiting Bali. What's more, if you watch surfers playing on the waves with their surfboards it's really a very interesting sight. Apart from surfing, on this beach you can also do activities such as relaxing, sunbathing, playing and fishing. Keramas = Kera (monkey) + Emas (gold) => Gold Monkey, but even then the monkey disappeared which became a mystery until now.